The policy which decrees that licensed premises in the Borders should only be permitted to serve alcohol beyond 2am “in exceptional circumstances” is set to be reviewed. The edict, which notably excludes the university town of Galashiels, was cited at this week’s meeting of the Scottish Borders Licensing Board. There, Hawick nightclub boss Neil Gillies sought an extension to his opening hours, until 3am on Sunday, April 17. 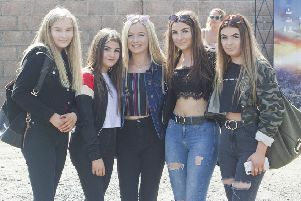 At the beginning of last summer, and despite police objections, Mr Gillies, who runs the Base Nightclub in Baker Street, was granted a similar one-hour extension in order to cater for the traditional Hawick Common Riding celebrations. At Newtown on Tuesday, Mr Gillies told Scottish Borders Councillors that he wanted the extra hour next weekend to cater for the “locals, visitors, tourists and returning students” who were in town for the annual seven-a-side rugby tournament on Saturday, April 16. The board was reminded of its late licence policy by Licensing Standards Officer Ian Tunnah who noted that most licensed premises in the town centre, as well as the Hawick RFC clubrooms at Mansfield Park, would have a termination hour of 1am on the night in question. Mr Gillies countered by saying that Base was never normally busy until 1am at weekends and that his late opening would have no adverse impact on other businesses in the town. The application was opposed by former board chairman Councillor Gavin Logan (Tweeddale East) who contended that the rugby tournament would not constitute “exceptional circumstances”. “If we grant this application, we will have to revisit our policy,” he stated. Scottish Borders Councillor John Greenwell (East Berwickshire), however, accepted the business case for the late licence request, and also noted that the police had submitted no objection on this occasion. On a division, and with Hawick councillor David Paterson having “declared an interest” in the application, the board eventually voted to grant the extension, by three votes to two. Although the police did not object to this week’s bid, former Police Scotland chief constable Sir Stephen House, in his annual report for 2014/15, criticised the board for granting licensing extensions which he says are “clearly in breach of policy”. “This has been disappointing as it provides a precedent for other applicants to submit applications outwith the policy,” Sir Stephen added. Tweeddale Press understands that the Scottish Borders Licensing Forum, chaired by Mr Tunnah and comprising of representatives from the police, the licensing trade, NHS Borders and members of the public, will discuss the effectiveness of the policy when it next meets on June 7.